Because I admire Francis K's perfumes and trust his talent, I stick with the weirdness. And what do you know -- by the fifteen-minute mark, Oud sorts itself out, the discordance resolving into harmony. Obligatory shot of Kurkdjian looking soulful. Oud is a "fresh" rendition of the fumie's favorite fungus. This is a full-but-sheer oud perfume. It's not blockily bludgeoning like a Montale, nor is it the savory leather of By Kilian Pure Oud. MFK Oud is soft, with a fruity veil. Listed notes include saffron and elemi gum, present in a subsonic way. As it subtly brews on the skin, faded curlicues of smoked cedar tease the nose. This is an oud that does unexpected things, strobing lightly across the spectrum from animal and vegetable to mineral. MFK Oud very much a “table for one” scent, hovering close to the wearer -- and perhaps also involving the lucky person sitting on the wearer's lap. Stefush, I don't want to overstate the cheese, because it's more of a "cheese feeling" than a crumble of blue on your tongue. But I know from experience that when talking about perfume, words like "cheese" stick out like "CHEESE", screamed from the highest hill, because it's such a "one of these things doesn't go with the others" concept. So for our purposes here, I'll stress that it's less cheesey, more of a passing yogurty tang that blurs into the cedar. Is that better for you? Otherwise, I can assure you that this is a strangely fresh oud, although that still not appeal, any more than a "light steak" would make sense. I am a huge Francis Kurkdjian fan, and i can't wait to try this one. The Cheese note is fascinating, both JAR'S JARDENIA and the Amouage Attar Oudh Al Khaloud have smelly cheese accords, and i hope this is just as startling as those two are. Chris, I *really* need to pull back on my cheese talk, 'cuz I yack out the frommage-phobes and overstimulate the cheeseheads. Having tussled with Jardenia's festival of cheese, I can assure you that you will most decidedly not be startled by MFK Oud. But you may still quite like it! Eau de Stilton by the Stilton cheese makers Association(SCMA) was a huge disapointment, wouldn't you agree ?. I thought you were kidding, but a quick Google search revealed the existence of this thing. Kerrrrraaaaazzzzeeee! Gorgonzola(JAR'S JARDENIA) + Parmesan(Amouage's Oud Al Khaloud). Surely there can never be enough Cheese. The smell of cheese and that of agarwood are both those of infection- one milk and one wood- are they not? I feel like I've just named the next Calvin Klein! Infection. A new fragrance by Calvin Klein. I may have to hit up TPC just out of curiosity for some of these! I never would have guessed "cheese," as a perfume note. "Slice'n'Easy"! Not one of Don Draper's best. Ooh no. He's back tonight, just when we ditched Sky! Have you ever tried Eau de Stilton by The Stilton Cheese Makers Association ?.You don't know what your missing. This is like that famous Dear Abby column of my youth when a raging debate about the proper way to hang toilet paper (over the roll toward or away from you) went on for weeks. The more we tried not to talk TP the more we couldn't help ourselves. Please no more cheese talk, I beg you! The MFK Oud sounds like it is worth a try. I loved how the diesel note in By Kilian's Pure Oud fades to something less harsh, and beautiful. Haha, I remember that Dear Abby debate. (For the record, over the roll is the *only* way to feed the t.p.) Cheese cheese cheese cheese cheese. I cannot believe how bad this stuff is. Smells like a Fruity/Saffron chemical toilet bowl cleaner. I can't help wondering if FK was put under pressure by his paymasters to jump on the oud bandwagon, when he had no desire to do so. How can someone so talented as Francis Kurkdjian produce something as awful as this ?. My conspiracy theory is that he has sabotaged his own scent, in revenge for being forced to do something he did not want to do. HERE YOU ARE MR FATCAT MARKETING MAN - TAKE THAT. 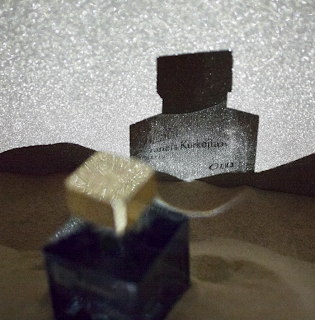 Chris, according to Francis K's comments in his conversation with Persolaise, he was "encouraged" to produce an oud perfume by the powers that be. Look's like my theory was'nt too far off. I am a big admirer of FK'S and i thought this would be at least on par with Mona di Orio's Oud or the By Kilian's. It's such a shame, for nearly £200 i can't see too many people wanting to own this. Hi Katie, I don't like the perfume, but I love the way you wrote your Oud perception. It was very intriguing. I felt like I was in a Bond movie. I loved it from the moment that I put it on. Some of the Montales don't work for me. Mono di Orio took a bit of a drydown to get out of the barnyard into some lovely light oud'y roses. I didn't get the cheeze like you did Katie, from FK Oud. I'd love to go in on a split of this stuff. sphexes on youtube...One syllable Scott in real life. Scott, FK Oud has some devoted fans. It's different enough from the other oud kids to start its own cult.